During the time of loss, finding the right words that perfectly convey the sympathy, love, and memories shared with someone can become very difficult. With a lot of emotions and thoughts that race wildly inside your mind, choosing the ones that are appropriate for the situation can be tough that you might entirely run out of words. In this rare instance of our life, we need something that would help get the message right for our card. 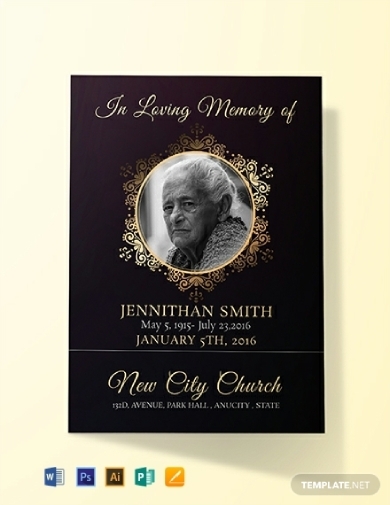 Thankfully, provided in this article are funeral card templates and examples that you can use. 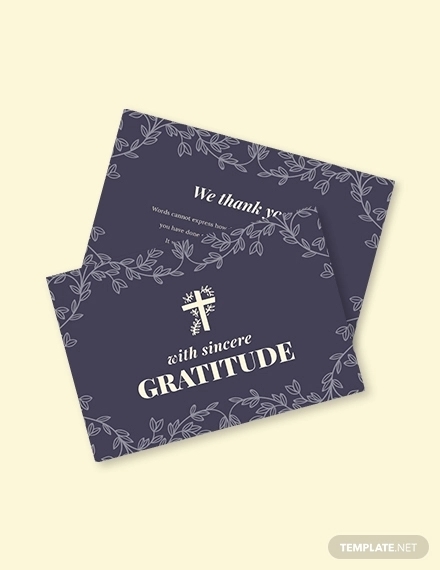 May it be a thank-you card, greeting card, prayer card, invitation card, or memorial card, we can help you in these various card types. You might be wondering, what am I going to write in a funeral thank-you card? Firstly, you must know the specific purpose of your card, such as thank you for the meals, thank you for the snacks, thank you for the funeral flowers, thank you for the memorial contributions, thank you for the help, and a lot more. Additionally, you may also send thank-you cards to the people who have greatly contributed and helped during this tough time, including clergy, pallbearer, and those who attend the funeral service. 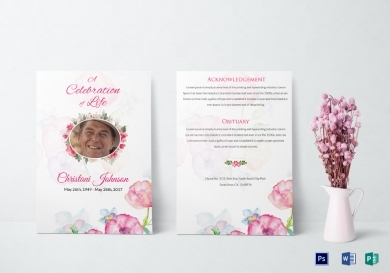 Creating and sending cards to different people can be so much easier with the use of this customizable funeral thank-you card. In order to send your heartfelt gratitude to the people who show their support and sympathy while you are in this difficult time of your life, you can write them a thank-you card. Using this professionally designed template, it would be easy for you to create a card in just a snap. This is available in various file formats—Illustrator, Photoshop, MS Word, Publisher, and Apple Pages—making it very convenient to use and edit them using appropriate computer applications or programs. Lessen the stress of funeral arrangements and use this easy-to-use watercolor funeral thank-you card. Designed by expert graphic designers, you are guaranteed high-quality graphics and a customizable file which is available in file formats so you can choose which file format is compatible to your computer application. On its borders are soft designs of pastel-colored flowers, complementing the cursive and serif fonts on its text for an increased visual appeal of the card. Creating a card is not as difficult as you think especially with the help of templates that can easily be downloaded and edited, such as this floral thank-you card. 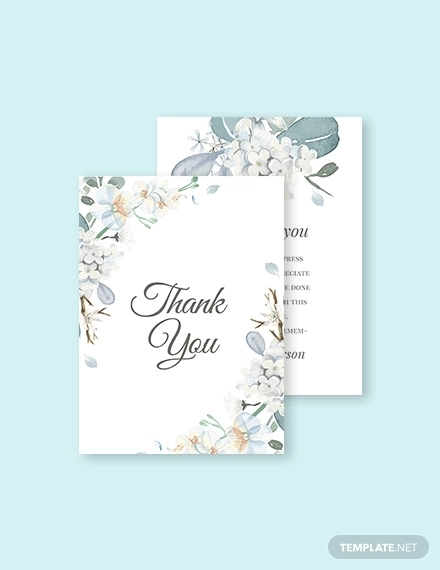 Designed with flowers that gives peace and calm to the reader, this thank-you card is perfect if you want to achieve an artsy and refined look for your card. 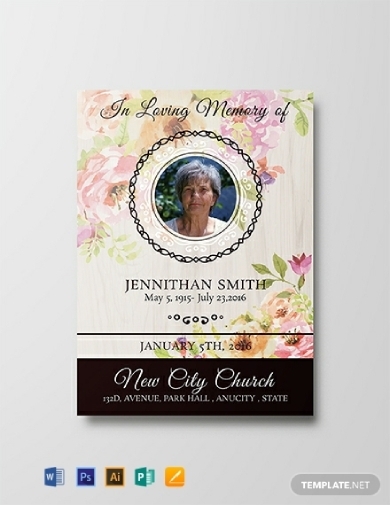 You can edit and personalize the text, and you can replace the photo with the picture of the deceased. You can also move and drag the elements around until you get satisfied with the design. Why work from scratch when you can use a template for your card that is highly editable and customizable? Through the use of this card, you can skip the hassle of designing your own card as you can just use the template, edit the text and the photo, and incorporate the necessary details for your card. You can also immediately send the card to the intended recipient by sending them an e-card or a digital card. However, you may also opt to send a traditional card for a more personalized touch. 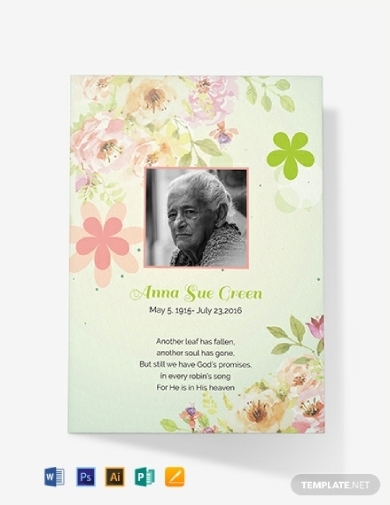 Honor and offer a tribute to the deceased with the use of this memorial card. 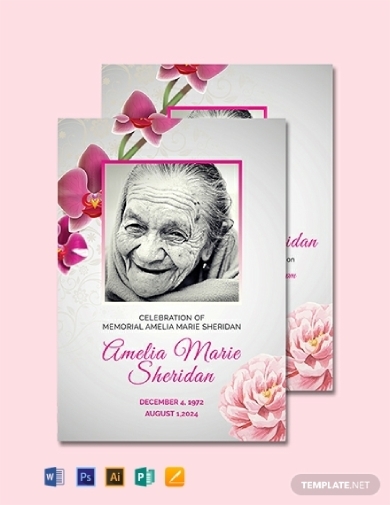 Also referred to as memoriam cards or prayer cards, these cards are popular as a meaningful keepsake for those people who attend the funeral service. This is also distributed at visitations, wakes, and celebrations of life. 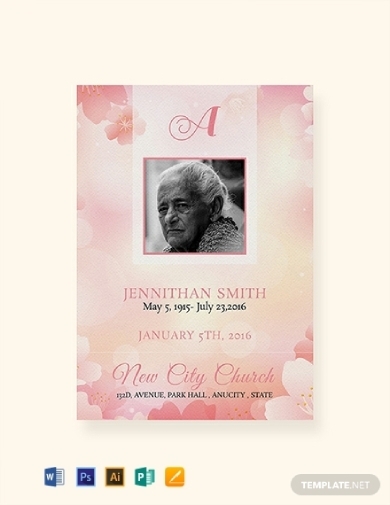 To create a memorial card in just a few clicks, you can use this funeral memorial card. 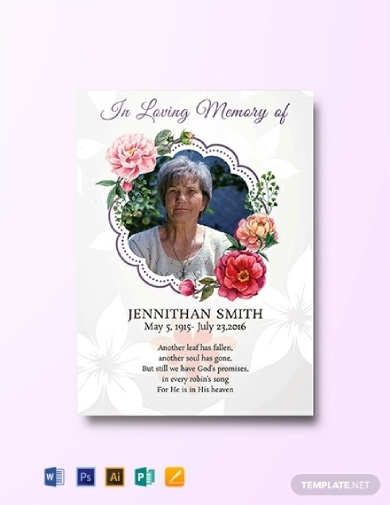 Available in Illustrator, Photoshop, MS Word, Publisher, and Apple Pages file formats, this memorial card is convenient and easy to edit for the users. When we say funeral greeting card, this would equate to funeral sympathy card or funeral condolence card, which is sent to the surviving family members of the deceased. Through the use of this memorable funeral greeting card, it would be easy for you to write the appropriate words in order for you to convey your sympathy and condolences. You can edit the text as well as the design so it would fit your preferences. Traditionally, a prayer card, also known as holy card or memorial card, is provided at funerals, but they do not necessarily feature information relating to a specific person. However, as customization is becoming more affordable and printing is becoming cheaper and more accessible, these cards were adopted for use as a memorial tribute. 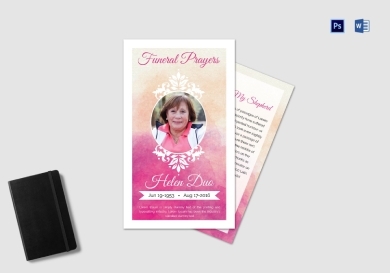 In order to easily create this type of card, you can use this funeral prayer card template and edit the text, photo, graphics, and other features. Historically, there are no formal invitations sent out for the funeral or memorial services. However, this would be difficult for relatives, especially to distant family members, to decide if they should attend or not. The general rule is that if you want to attend the funeral service and the event is open to guests, then the relatives must go. In order to settle this matter, a funeral obituary invitation card is needed. With this, there will be a formal invitation to the relatives and friends of the deceased so they can attend the funeral program or service. 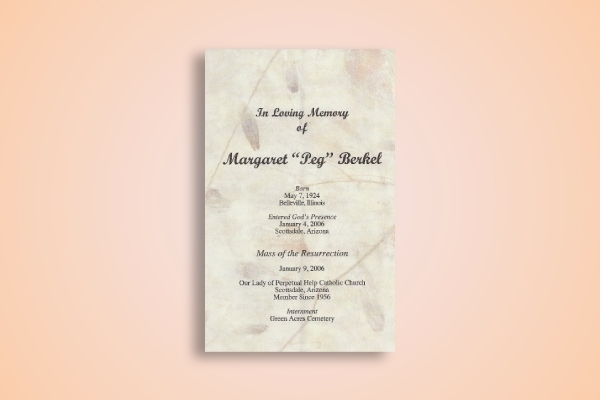 This funeral card example features a pastel-colored marble-like design on its background. This complements the plain text, making the simple design elegant and sophisticated. 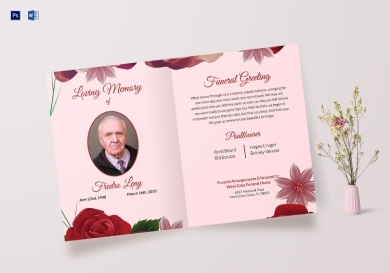 This is used as a notice and invitation card to the relatives and colleagues of the deceased, notifying them of the passing of their loved one, so they can attend the funeral program.